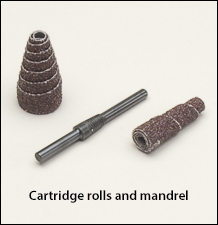 Cartridge rolls, cartridge roll mandrel, tapered cartridge rolls. SAFETY WARNING: Make sure the maximum RPM of the roll you choose below, is more than the RPM of the power tool you are using. RPM of power tool cannot exceed (must be less than) maximum RPM of these items. WARNING: Proposition 65 Label for all cartridge rolls and mandrels shown below. Full tapered cartridge rolls with aluminum oxide abrasive and resin bonding. Ideal for blending, deburring, and finishing. For inside diameters, lapping operations, and dead end holes. Many additional sizes and grits available. Please call us for pricing on silicon carbide grit or zirconia abrasive grit, or if you prefer the straight style cartridge roll design. Sold by the pack, 100/pack. and pilot hole size Grit Mfg. For either of the full tapered cartridges listed above. Please call us for pricing on additional sizes of these steel mandrels.